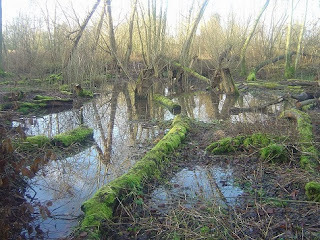 I went along on New Years Day to see if any of the deluges over the holidays had made their way to the hole. About 50mm in the bottom at most. Hugely disappointing, I thought to myself, after all the effort put in by those involved. Then, on 11th January, I had a message from Steve Loyd relayed while I was on an Archery course that the hole was full. Whoopee! Today (19th January) I went along again to see for myself. I could just about make out where we had dug the pond. 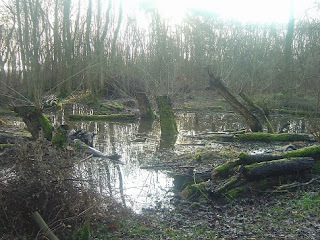 The pictures show how much water is around at the moment, bearing in mind that the pond is not too far from the top of the woods!